Testing is done, time to play! Getting patterns ready for testing makes Jen a boring girl, blog wise and social media wise anyway. Yesterday, though, I got to play with fabric. Of course it had to be flamingo fabric, but look at this too cute little pouch! 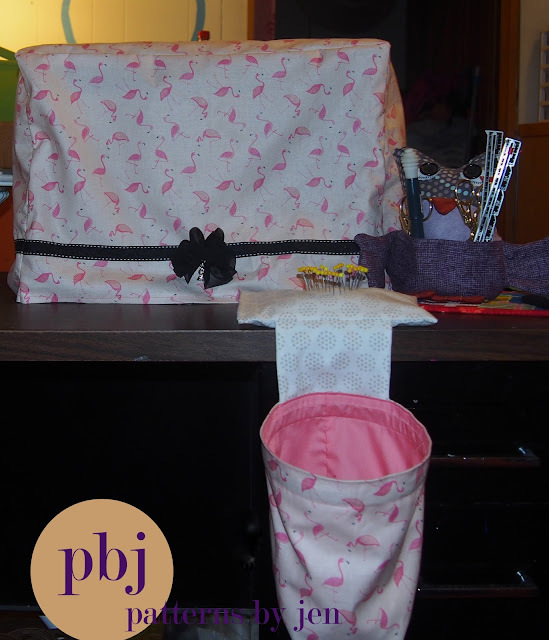 It demanded flamingo fabric! This pouch is called Charming Tinsel Pouch, and is too cute for words. Amista from Hilltop Custom Designs designed this darling thing. You can find her blog here, and her store here. I did have an issue with the instructions for the zipper. If it were morning I would say it was because I hadn't had enough caffeine, but since it was in the evening I'm going to go with too much caffeine. Amista was quick with her response and already going though the pattern. Zipper issue aside, which I know she is fixing so don't let that stop you, this was a quick and easy sew. 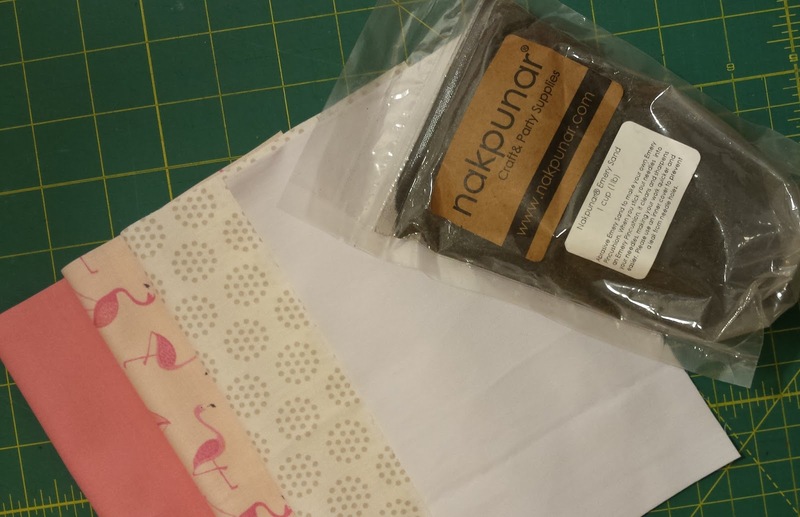 A couple of hours and you have this sweet little pouch ready to hold your make up, jewelry or, lets face it, all our little sewing notions that we can't live without. This is why I order extra fabric when I find something I love, so I can put it on the back and not care, because I have more. Plus, why do we hoard our favorite fabric, we should be using it and adoring it out in the open for everyone to see! Or maybe not to see. 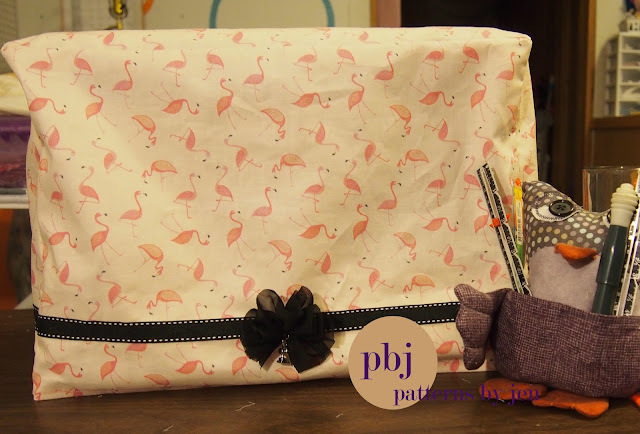 Look at those little flamingos peeking out, aren't they fun? Too much flamingo? Is there such a thing?! I say nay! Bring on the flamingos! Is there a fabric, novelty or not, that you tend to be drawn towards, and maybe have more of then you might want to admit? Is it as cute as my Holiday flamingos? Is there some that you have been hiding/hoarding and should start making plans for? 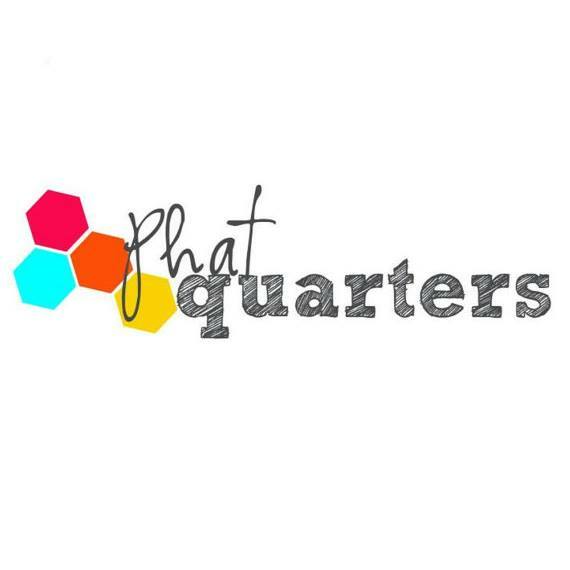 As a post script to this post, I want to remind you that Phat Quarters still has their coupon code for PBJ followers! It is good through the end of the month, which by the way, is right around the corner. SOB! Where is summer going? 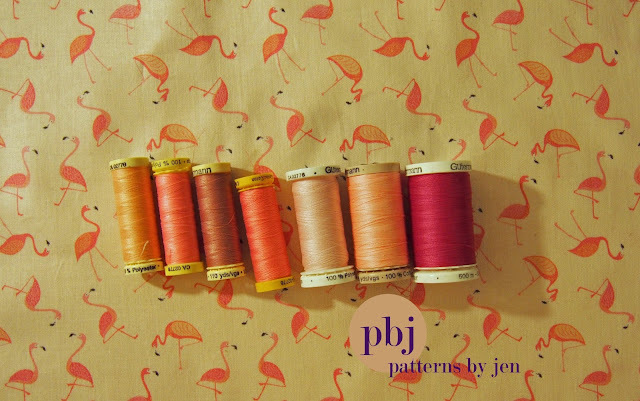 You can get your own flamingo fabric! OK, fine, get something else, that just means more flamingos for me! 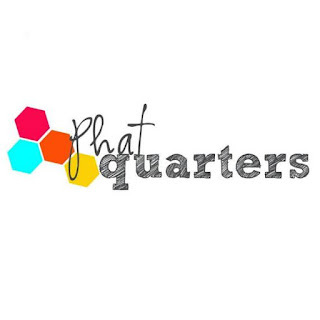 They have some really cute prints, and you should really go here and check them out. 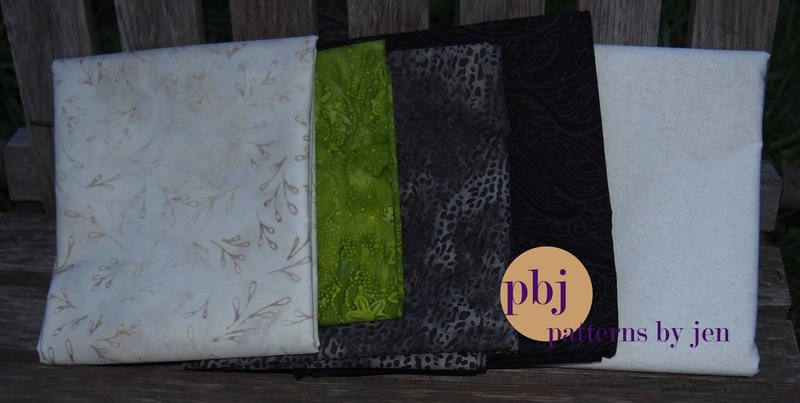 Use coupon code PBJ25 to receive 25% off of $20 or more. 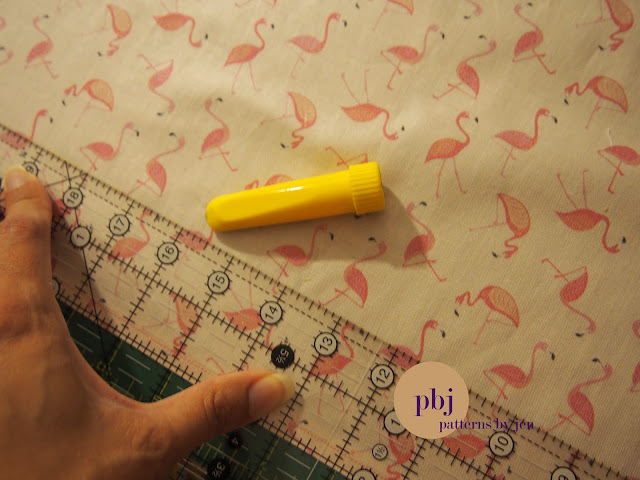 Then, pull out that fabric you have been saving and make something! 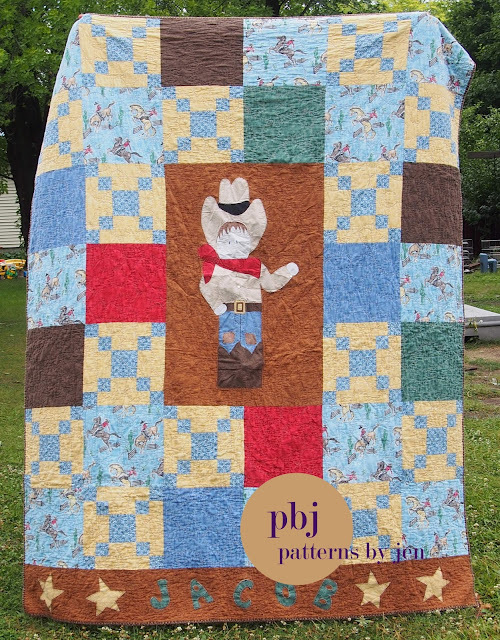 Linking up with Crazy Mom Quilts Finish it Friday, What a Hoot TGIFF and Confessions of a Fabric Addict - Can I Get A Whoop Whoop. 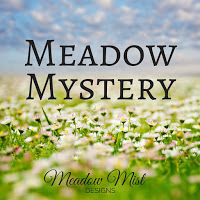 Cheryl over at Meadow Mist Designs has invited us to join in her Meadow Mystery, which will post on the first Thursday of each month. Her first post was earlier this month with fabric requirements, you can find that post here. 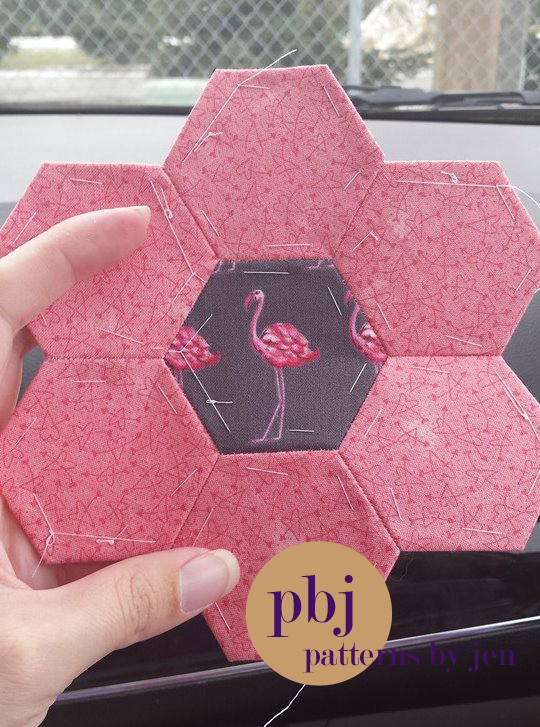 She also shared a post that has a kit available, as well as some other fabric suggestions, you can find that post here. I chose to do the black and white with a pop, but purchased from my local shop. I did something different, for me, and went with batiks. If you know me your face should look like that emoji that has seen a ghost. Yeah. Crazy. These are not shown in the correct order, and no matter what my flash might say, it was not dark when I took this picture. The next set of instructions comes out next week, you still have time to join in the fun! 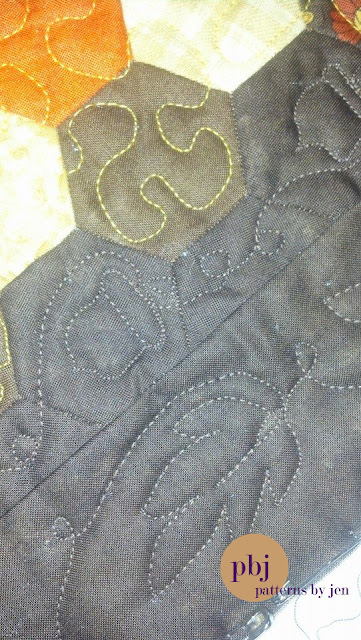 I am joining the Snowflake Shimmer Quilt Along hosted by QuiltingJetGirl. Today's post is about color. 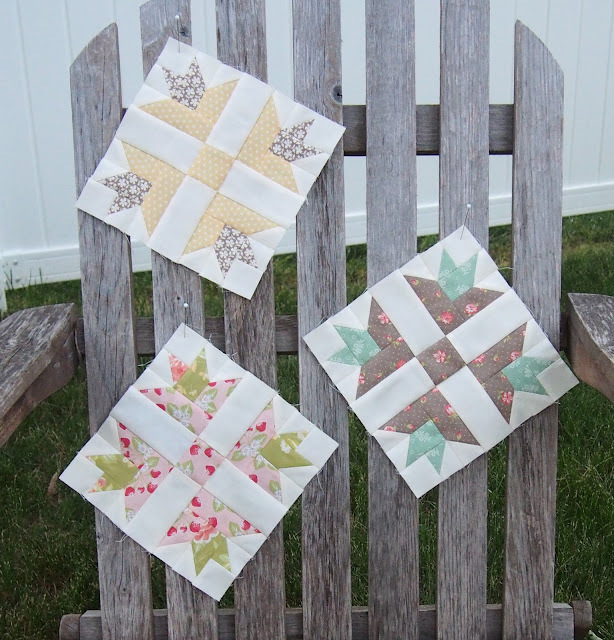 The beautiful quilt Yvonne has designed uses just three colors. 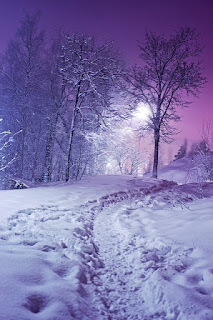 I used this photo, entitled Snow is Not White in the Night, from Kimmo Kulovesi as my inspiration. I have been thinking for a long time that I need to make myself a quilt in purple, and have decided this will be the one. These look more blue then they really are. That dark purple is scrumptious in real life. I'm so excited for the next step in the Snowflake Shimmer Quilt Along! We are just getting started. 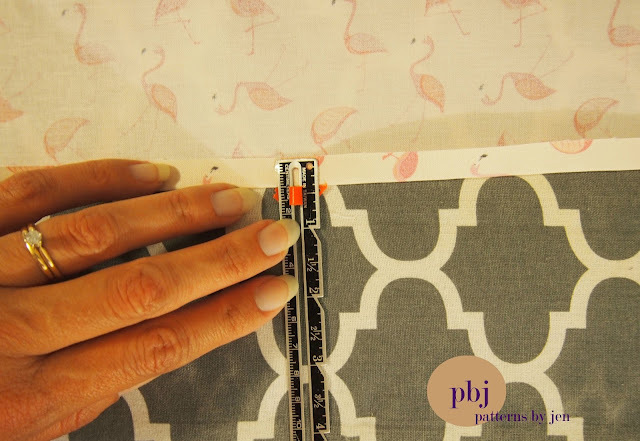 Check out the first post here with instructions for fabric selection and amounts. I am linking up at Quilting Jetgirl here. I had to do it. It was time. Past time even. 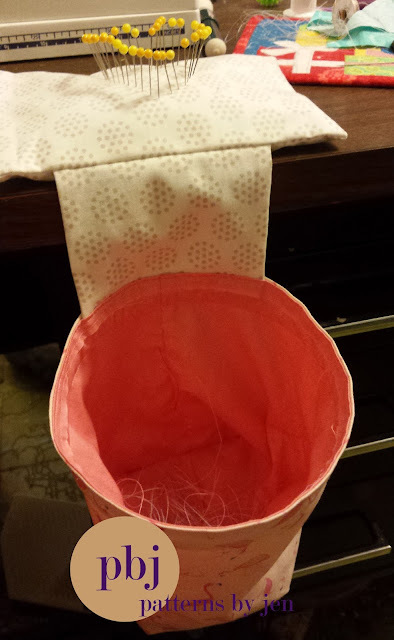 I had to make a thread catcher. 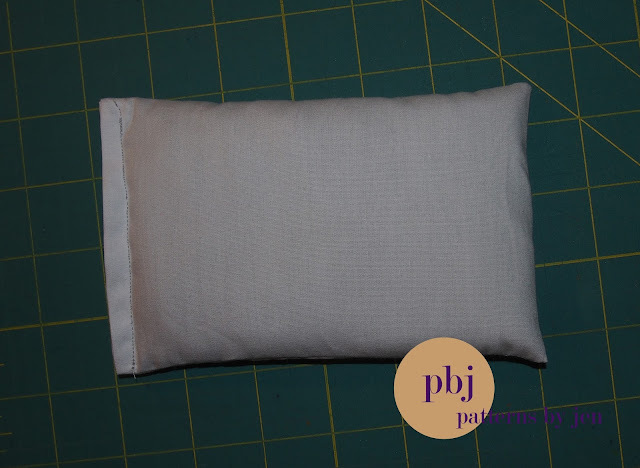 I chose Man Sewing - with Rob Appell's Weighted Pin Cushion with Scrap Bag. I followed the instructions from Man Sewing, but I did add an extra piece to hold the emery sand. It's pretty fine, and I wanted an extra layer. It looks like a little pillow. Awwww. 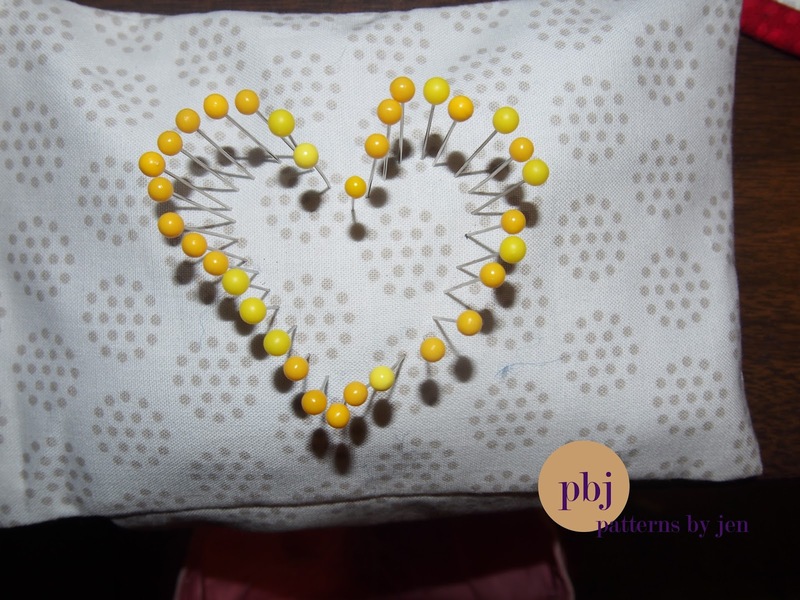 I put this pillow into the pin cushion section when the walnut shells are added in the tutorial. This was not a set up. 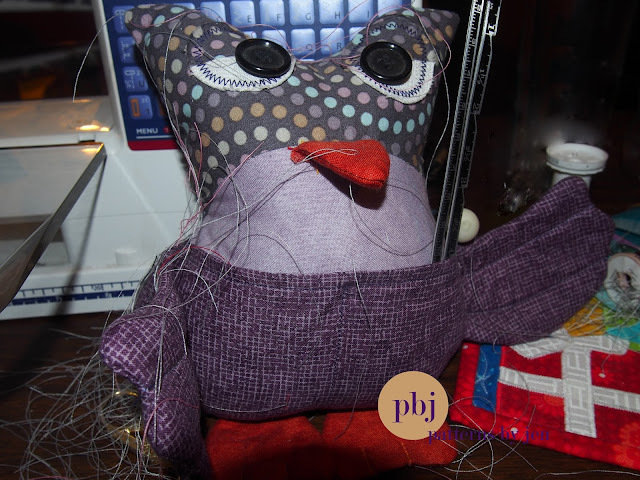 My poor Owl You Need Sewing Buddy, found in this PBJ here, was in desperate need of saving. 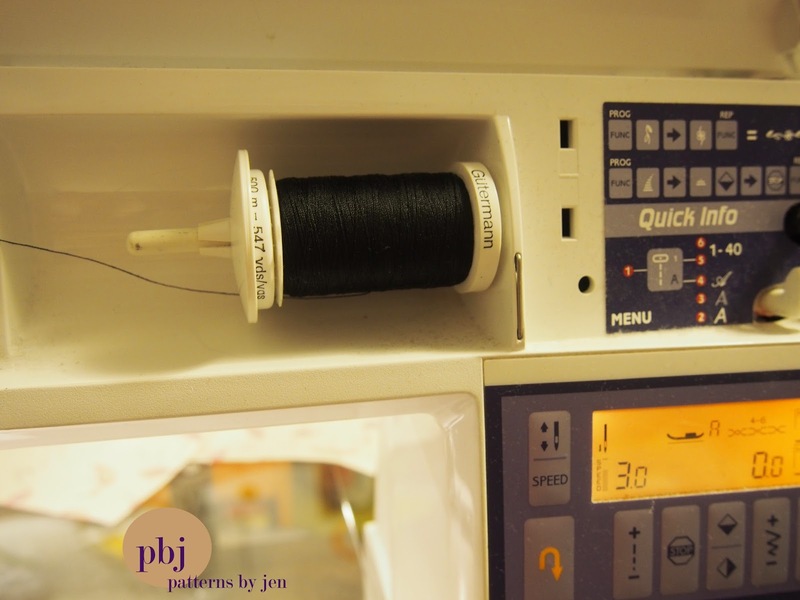 Now I have a set, June's PBJ was the sewing machine tutorial, find out more here. My helpful little owl is all cleaned up and happy again, and only holding helpful tools, not clipped threads. 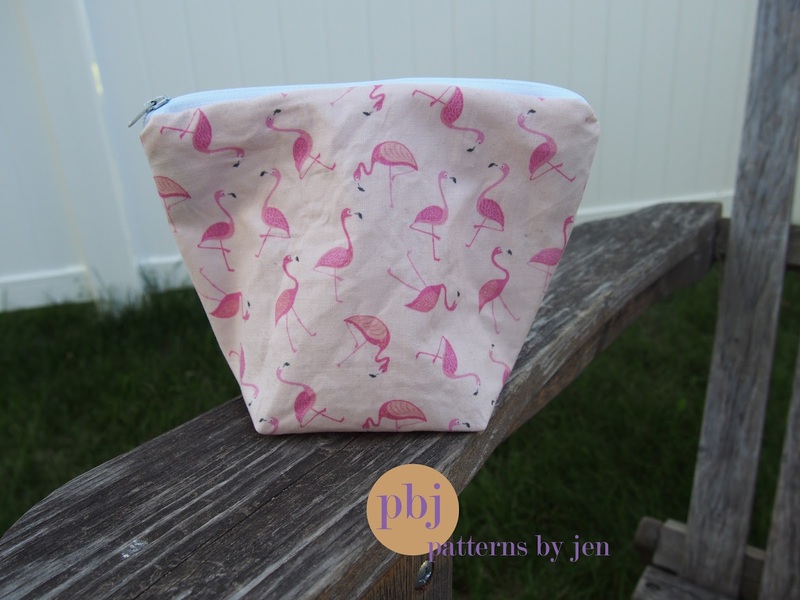 Find your flamingo fabric at Phat Quarters, and don't forget to use the code JPG25 to receive 25% off of orders $20 or more. This code is good through the end of July. Remember when I said June was busy? It was so busy, I forgot about the Picked By Jen post! Which actually works out, because I can do two Picked By Jen posts in a week, and they match. So cute! The first one is for a sewing machine cover. I chose the tutorial from Purls and Pleats. There are many, many tutorials out there, but I wanted simple. That's kind of my theme, simple, easy, quick. 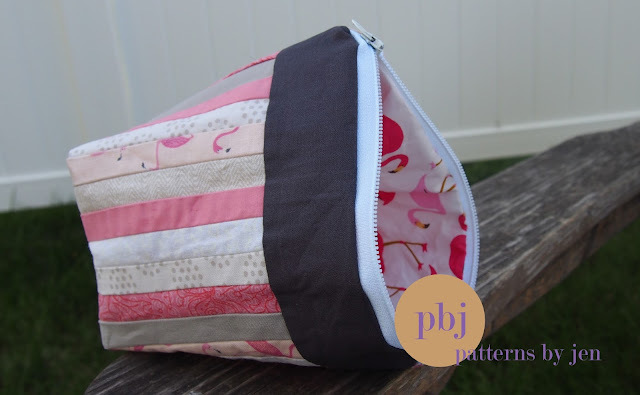 Marrie, does a great job walking you through the steps of this sewing machine cover. I did add a touch of my own, because, well, I could. Ha! So can you! The first change I made, was that I hemmed all the pieces right away, before attaching them. There is no real reason for this, other then I didn't want to mess with the cover when it was put together. Lazy stitcher here. Its definitely a cleaner finish when you hem around the bottom last, though. I pressed the hem before stitching, making it 3/8" wide, just so I could use my 1/4" foot and not have to worry about catching the fabric. Who knew I had so many pinks to choose from for the top stitching? Next, I chose some ribbon to go around the bottom part of the cover. 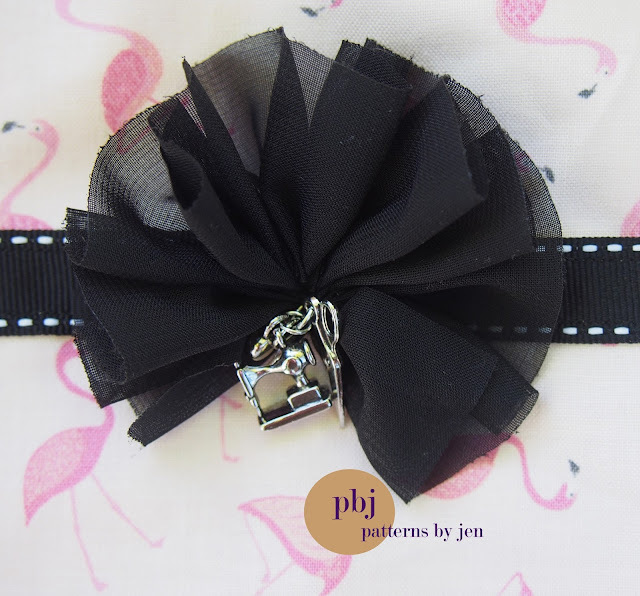 Once hemmed, I measured and marked 2" from the bottom for my ribbon. I marked both sides and front and back. Lining up my ribbon along the marked line I stitched one end (look how I can use my foot as a guide, easy peasy). Then flipped it around and stitched the top end. How you stitch this will just depend on the width of your ribbon. I could have just stitched once down the middle and been done with it. 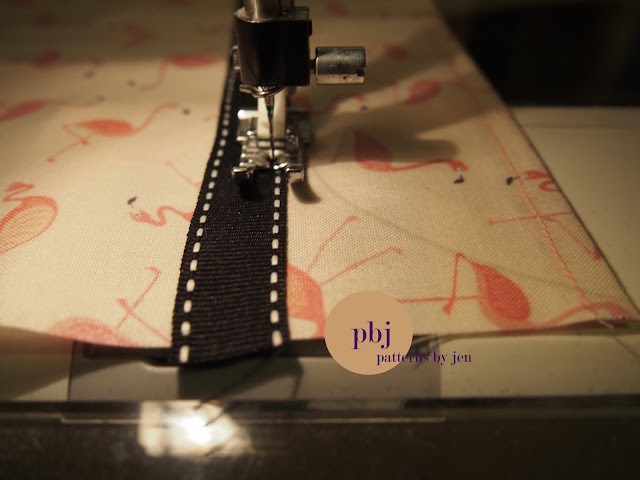 I cut my ribbon about 1/8" longer then my pieces so that I could match them up when I sewed up the side seams. Once the sides were stitched and my ribbons were matching perfectly, I trimmed the excess ribbon. If I was really truly lazy, I would have just left them, but I think it would have bothered me. I was hoping to find a cute flamingo button to go on this, but I want it to be perfect, so I chose a sewing charm for now. Still extremly cute! This is the one picture I took outside, it shows off the pretty pink flamingos much better. I think lighting needs to be next on my list, especially as we inch closer to cold winter days when we can't go outside. 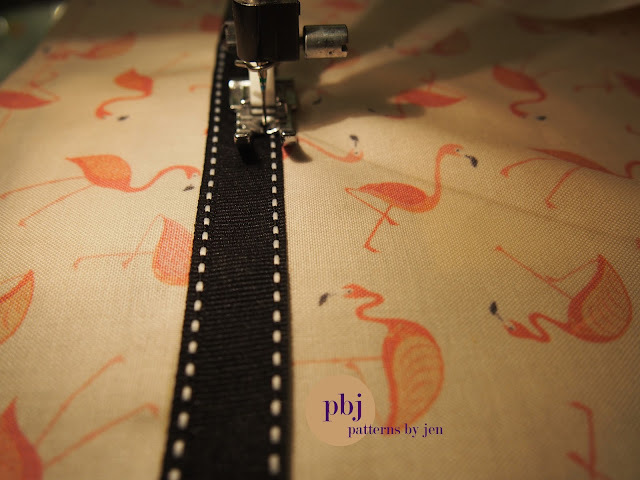 If you are a flamingo lover, or fabric lover, head over to Phat Quarters and use the coupon code PBJ25, which is still good until the end of July, and receive 25% off orders of $20 or more. Now I have my own, cute, totally flamingo sewing cover! Short and sweet. Yay! 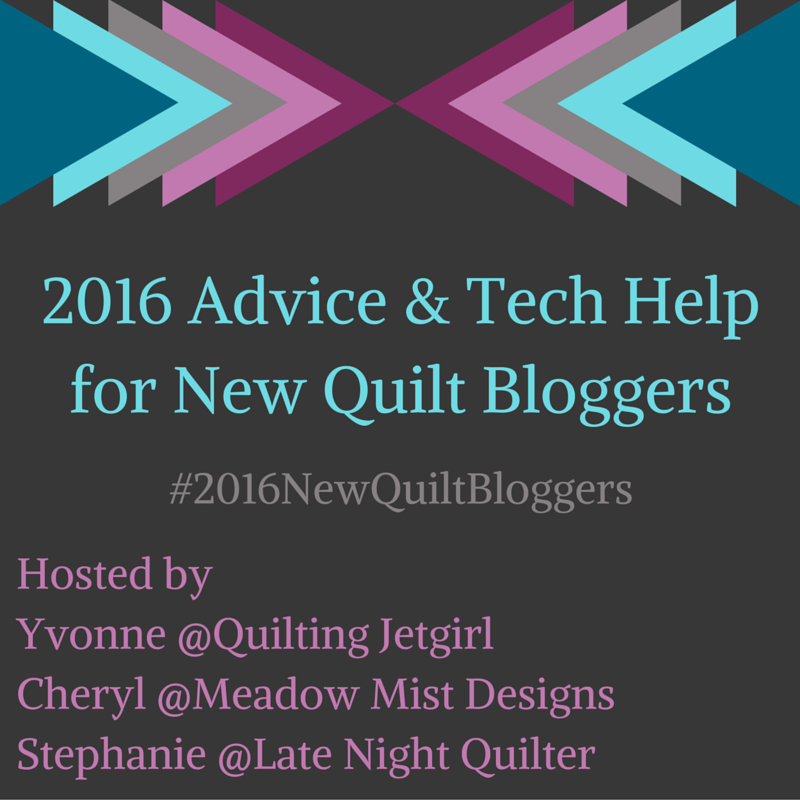 It's my turn to be apart of the 2016 New Quilt Bloggers Blog Hop. Don't say that fast, you will get all twisted up. You went back and tried to, didn't you? That's ok, so did I, and I'm the one who told you not to. Ha! 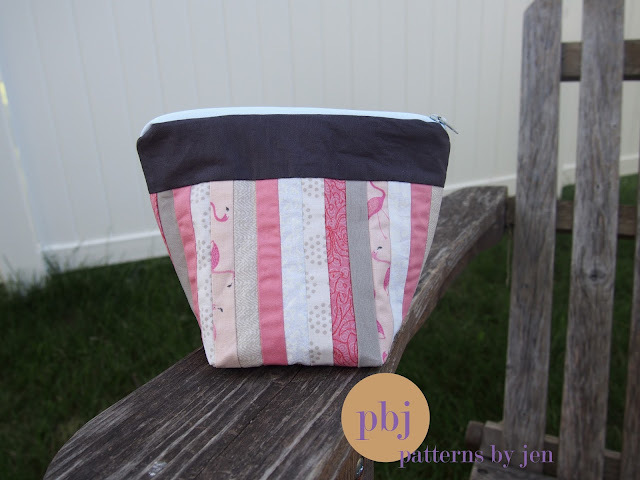 My name is Jen Shaffer and Patterns By Jen (PBJ) is my baby. Well, the last of my babies. I have four real babies, who are now 20, 17, 15 and 12 (so not so baby-ish) and I run a family child care out of my home, so I get to play with other peoples babies. 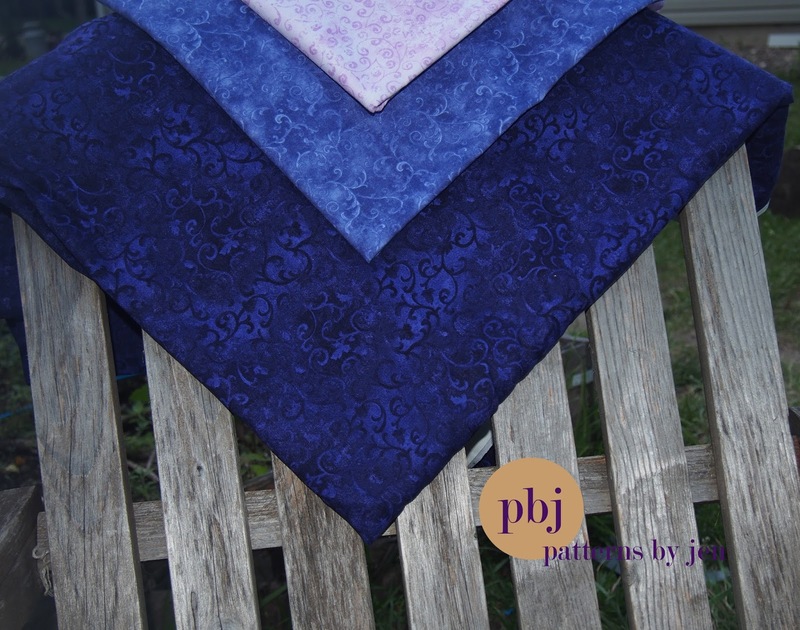 PBJ is my "grown up" baby (as in, I get to be an adult while running this), that morphed from Jennygirl designs. Jennygirl designs was something I had planned on naming my business for years. Then one night, I decided I wanted something catchy, something that would stand out (plus there was already a Jennygirl Designs for something else). As I tossed and turned Patterns By Jen just came to me, but the best part was the acronym. PBJ. It made me smile, and maybe giggle a bit, and since I love purple, I decided my business colors would be the colors of a peanut butter and grape jelly sandwich. Mmmmm, it makes me hungry every time I see it, or think about it, which could really end up being a problem. 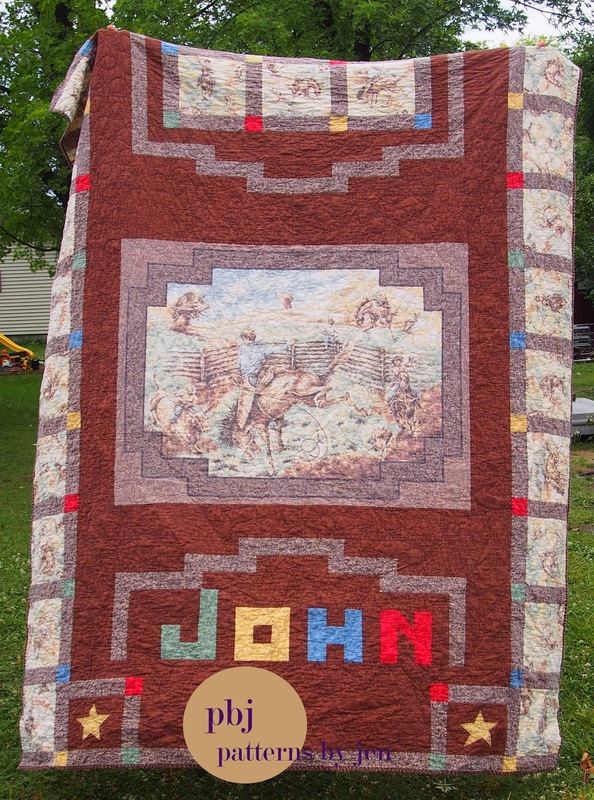 This quilt was tied and my mom helped my bind it on the way to Grandma's house. It took me 10 years to make another one. This time I chose to make 2 quilts for my boys. They were 6 and 3 at the time. I found a panel that I loved for my oldest, John, and then found a younger looking cowboy fabric for the 3 year old, Jacob. Then I had to come up with a plan. It was my first voyage into quilt designing. 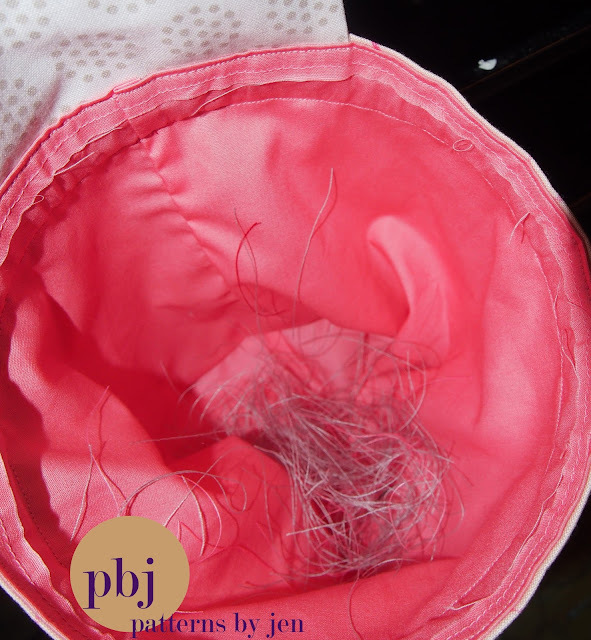 They have been used and abused, the binding is fraying, the applique is coming apart. I love that they got so much love. 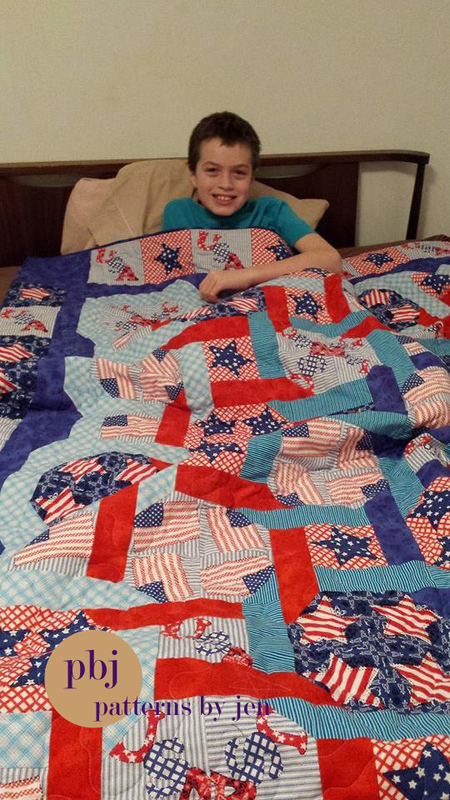 My youngest loves America, and asked for an American flag quilt. Done. It's busy, but he loves it. My favorite design that I came up with was a wall hanging for my father-in-law. He and my mother-in-law moved and I wanted to make something that would remind him of their old town, Mobridge, SD. 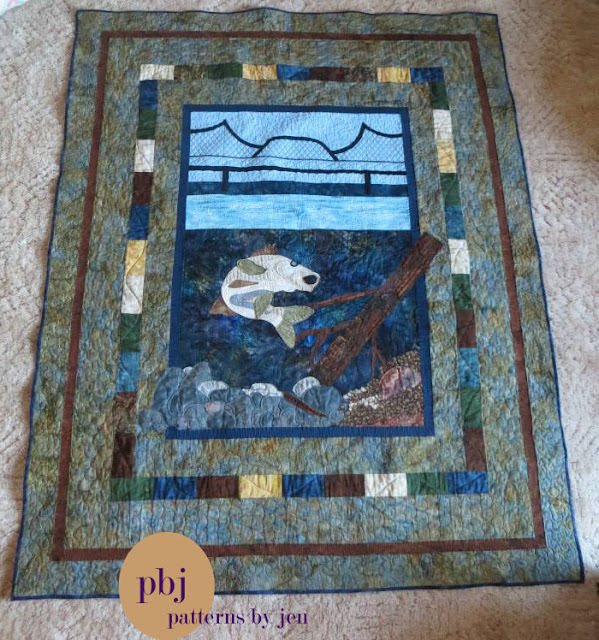 He loves to fish for walleye, but as any quilter will tell you, walleye fabric is pretty impossible to find. Bass, yes, walleye, no. This forced me to design the entire quilt, and I can't deny that I'm very happy with the outcome. I took a coloring book picture of a walleye and used fabrics to replicate it. Using some black fabric and stitching in black I made my version of the bridge. I say my version, because there is no way I was going to be able to replicate that bridge. I filled in with fabric that had rocks, and made my own rocks, as well as the tree. 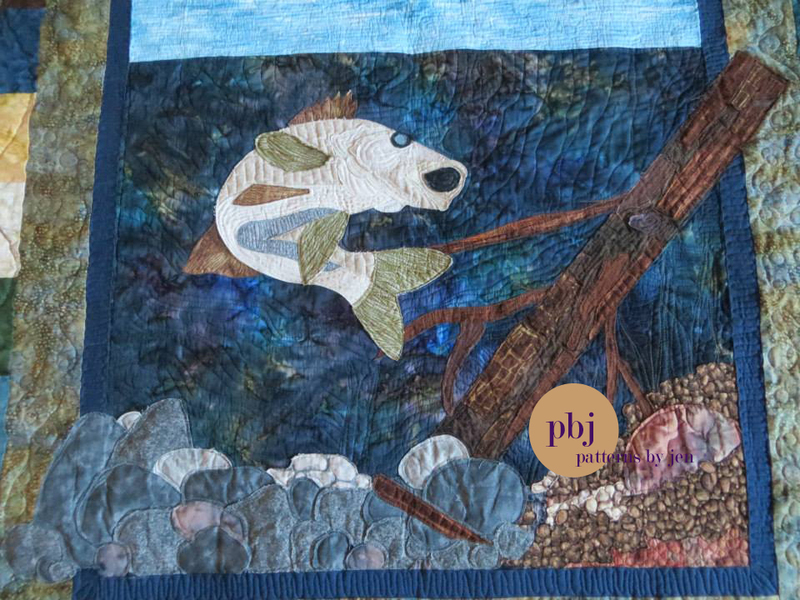 It was fun to quilt it and give it some underwater life, but it was more fun to give it away. That is why I make my quilts. 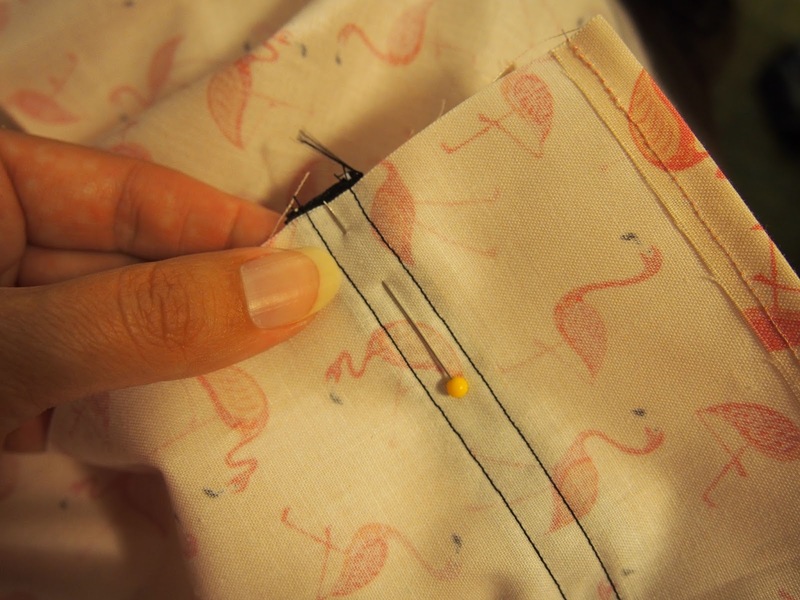 I also love EPP, English Paper Piecing, and hand embroidery, and flamingos. Thank goodness my husband likes to drive, because that is the only time I sit still long enough to do handwork. 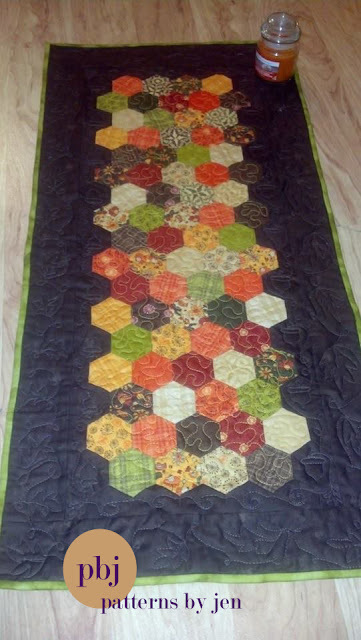 I love this table runner, I have finished two of them. There are plans in the works for this to be a class. I am particularly proud of the quilting on this one, especially the little acorns. CUTE! Lets get back to the blog hop basics. 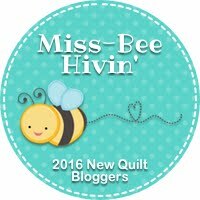 There are four other bloggers in my "hive" this week that you should go check out and leave comments with. As bloggers, we live to get comments, because that means someone is listening! 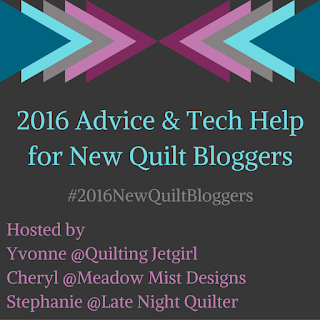 You should also go give some love to Cheryl @ Meadow Mist Designs, Yvonne @ Quilting Jet Girl, and Stephanie @ Late Night Quilter the three amazing women that pulled the newbie bloggers together for this blog hop and gathered the sponsors for all of the great prizes. 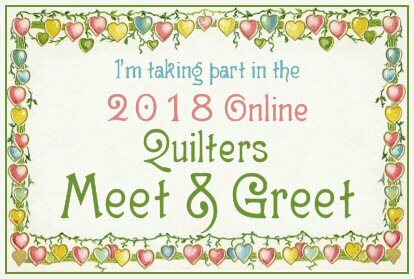 (Yes, there are prizes, go check it out!) 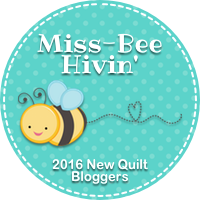 Yvonee and Stephanie also have "hives" of their own, so go check out those awesome bloggers, too. I have been encouraged and helped so much through this blog hop. I still have more to do with my blog, but it is so much better then it was. 1) Blogging tip: Running a blog takes time. You can drive yourself crazy trying to keep up with it, literally crazy, and nobody wants crazy. At least in my house they don't want *more* crazy. Find a time that works for you to focus on your blog. I try every morning before my child care Littles show up to do bloggy type stuff. Sometimes I'm ahead of the game enough that I can get a couple of blogs written for future publishing. Sometimes it's catching up on emails, or getting watermarks on pictures for future posts. I try really hard not to work on it after that morning session (other then to take pictures for it). I have plenty of other things to do, so sticking to that schedule means I don't let other important items get pushed back, but also means I am still doing things to improve it. 2) Quilting tip: SLOOOOOOOOWWWW down. Seriously. When I am getting frustrated or start to feel like I'm behind and I *need* to finish this, I put my machine speed down a level. It's amazing how your blocks can once again go together like they should, and how your seams are more accurate. If slowing down doesn't help, then walk away. Walk around the block, lock yourself in the bedroom away from everyone for a while, pour a bottle of wine, I mean, glass! Glass! Pour a glass of wine. 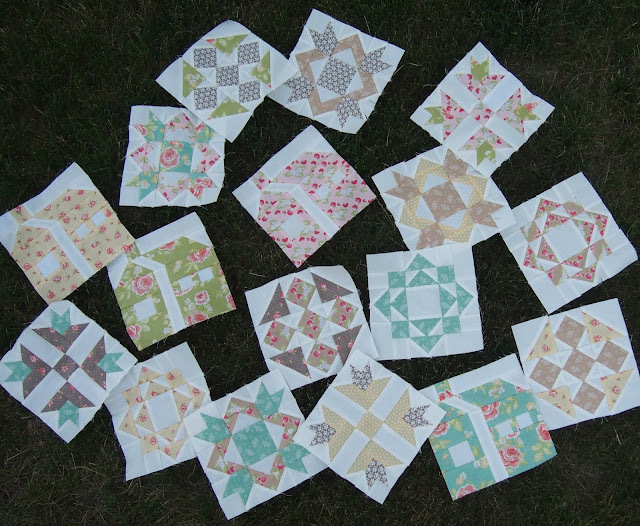 Quilting should be fun, and if you are frustrated/sad/angry, it's just going to get worse, so get out of there for a bit. 3) Questions time! 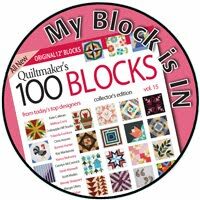 What quilt is on your bucket list that you don't think you would ever do, because it's beyond what you perceive to be your quilting level? Mine is the Mariner's Compass quilt. I love that design. Love, love, love it. I hate paper piecing. I'm so not good at it. Not at all. So it remains on my Quilt Bucket list. 4) Insider info. I love Anne of Green Gables. I love everything about her. I've read the entire series so many times I could recite all eight books for you. I love the first two movies, but have never watched the third, as I have not heard any good things about it as far as following the story line goes. My dream vacation would be to go to Prince Edward Island. Really. Yes, I think this is officially the longest blog post ever. Thank you for sticking around and getting to know me. Please, please, please head over to my fellow bloggers pages and check them out, and show them love.We need love in this world, lots of it, and we need to spread the love. Go spread it, and have a fabulous week! Yes, I'm still stitching in the Crossroads Quilt Along hosted by The Fat Quarter Shop. I'm just going with the whole "I'm two weeks behind every month" theme...again.... June's block was the Intersecting Block. They came together fairly quickly for all those little pieces. I'm still in love with these fabrics!! Yes, this is the same spot I have been taking all of my pictures lately. It's been a bazillion degrees out, and it's too hot to go looking for fun places to take pictures. I like my air conditioning and I don't wander too far away from it if I can help it. I forgot to take pictures, but I did cut the squares just 1/8" larger so I could square up my half square triangles. I just feel better about how things go together. When stitching the squares onto the rectangles, I always stitch just inside the drawn line. This seems to give me a more accurate piece. It sometimes takes me a moment to figure out which side I will be pressing towards. Hey, it's a lot of little pieces, and I'm old...er. There is still time to join in the fun. There are only a couple of months left, but there are only 3 to 4 blocks per month. 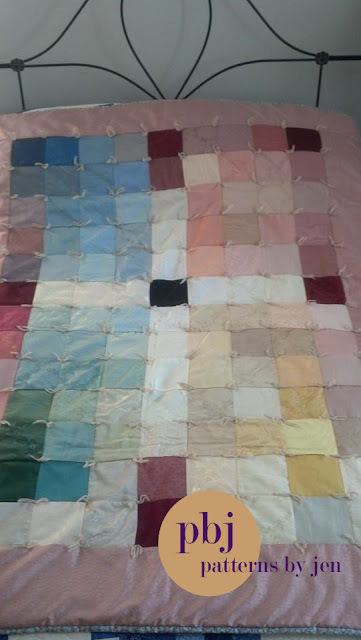 The quilt along is free, but a small donation towards March of Dimes is appreciated. They are currently below their goal, but I bet we can get them up there.